AEI says that is “awfully close” to distributional neutrality, and the difference could be made up by economic growth. Very true. Consider that just one of Romney’s pro-growth reforms, a move to territorial taxation, would allow U.S. corporations to bring home and invest some $1.7 trillion in currently locked-out foreign earnings. But more importantly, it makes little sense to pursue distributional neutrality when we have the most progressive income tax system in the industrialized world. The top 20 percent of households pay 94 percent of federal income taxes. The bottom 40 percent have a negative income tax rate, and the middle quintile pays close to zero. 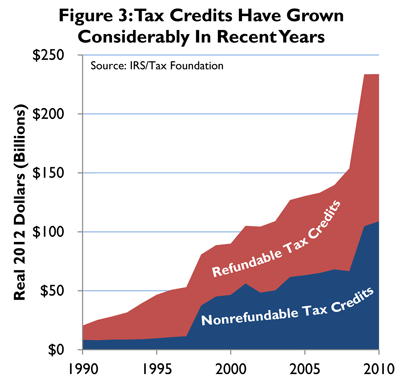 Negative tax rates are the result of refundable tax credits, such as the earned income tax credit and the child credit, which have grown 10 fold since 1990, from $12 billion in 1990 to $120 billion in 2010 (see chart below). Constantly pursuing distributional neutrality, we have achieved record high levels of progressivity. And there are reasons to think it has constrained economic growth. It is time to aim for something more tangible: a competitive tax system with low rates and a broad tax base.